See our artist feature on Greenblatt & Seay. Watch Greenblatt & Seay on Vimeo. 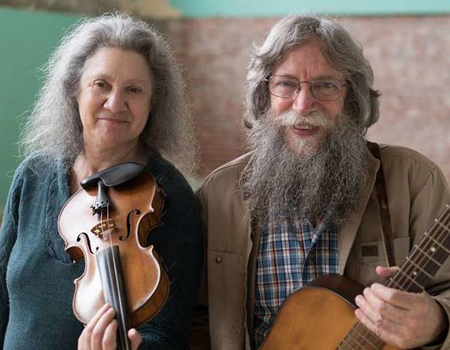 Traditional/Original Concert -- Debby and David play and sing fun, upbeat folk music fine-tuned for your event and age group. Fiddle, nyckelharpa, harmonica, banjo, whistles, hammered dulcimer, guitar, vocal harmonies and audience participation are often featured. Performances can focus on or include tunes from many different traditions, including Irish, Swedish, Danish, Jewish and Scottish. School performances are a specialty. Background Music/Strolling -- Lively traditional melodies played on a variety of instruments set a joyous mood for festivals, banquets, etc. Technical Requirements: Outside performances must be in a shady area. Performance area temperature of at least 60 degrees F. All shows can be performed without a sound system where appropriate. Maximum negotiable fee: $1,440 based on travel distance and length of performance.